Back in 2009, my friend Nick introduced me to the Travelling Moleskine project, a creation of the people at The Culture Vulture. The concept was pretty simple: Moleskine sketchbooks get released into the wild, each with their own theme, and the book gets passed around from person to person who takes up a page or a spread to creatively interpret that theme. The book which came into my possession was “Robots in Disguise”. In my own sketchbook I worked on a design for a robot who would be conducting a little espionage in the park. Some of the early concepts as I was finding my feet were frankly embarrassing, but everything paves the way for something and I eventually solidified two designs. One was a clumsy, oafish looking robot dubbed Turtle Bot, and the other was a small creature with a giant head given the (still) temporary name Cute Bot. I couldn’t decide which to use so I asked my Twitter followers for help and Cute Bot won out. 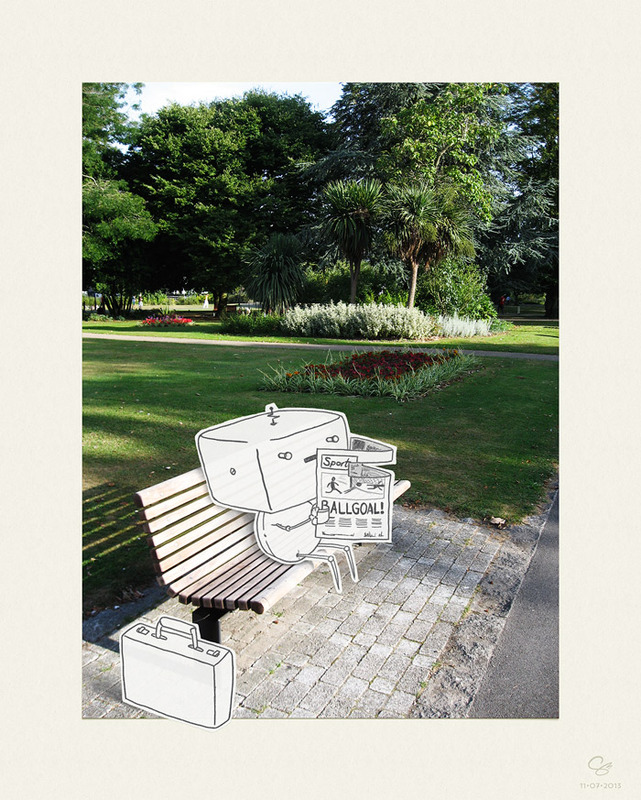 The finished piece involved a printed photograph and cutouts of pencil drawings of Cute Bot and his briefcase. These were carefully stuck to the page, followed by a little more pencil work to create shadows behind the robot and briefcase. In my haste I didn’t wait until daylight to take a photograph of my work, so the only copy of the final submission rests in a grainy photo taken in my kitchen. The book soon left my hands and moved along the chain. Frustrated that I didn’t have a better copy, I decided this July that I would digitally recreate the piece. The photograph was simple enough to dig out of iPhoto, but for the illustration I referred to extra sheets of the original drawing I’d created just in case I screwed up with the scalpel. After scanning, I retraced the illustration in Photoshop with a custom brush, and then masked the layer with a textured brush to simulate the cutout. By subtly dropping the opacity of this layer, I could further capture the feel of paper on paper. After adding shadows behind the robot and briefcase, and creating a paper background similar to the Moleskine, the work was done. Now I have a cleaner, sharper copy of the original that hopefully still lives out there. Somewhere. In retrospect I’m glad Cute Bot made it. I think it’s an adorable, expressive character with the potential for lots more exploration. The fact it’s fun and rewarding to draw helps, as he makes occasional appearances in my sketchbook. I hope it won’t be the last we see of it.